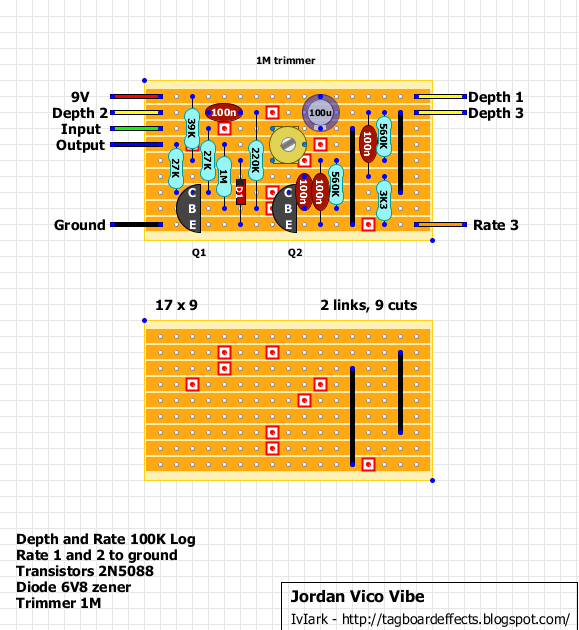 The jordan vico vibe interested me in early 2012 mainly because it's so simple. As a rookie solder jockey that wanted to build every type of pedal to try them all the specs sounded very appealing. 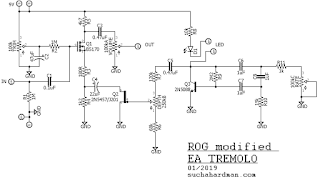 The tremolo circuit is about as complicated as a fuzz face (the pedal I built before that) and didn't use any optocouplers . Of course it's a little more complicated than that. 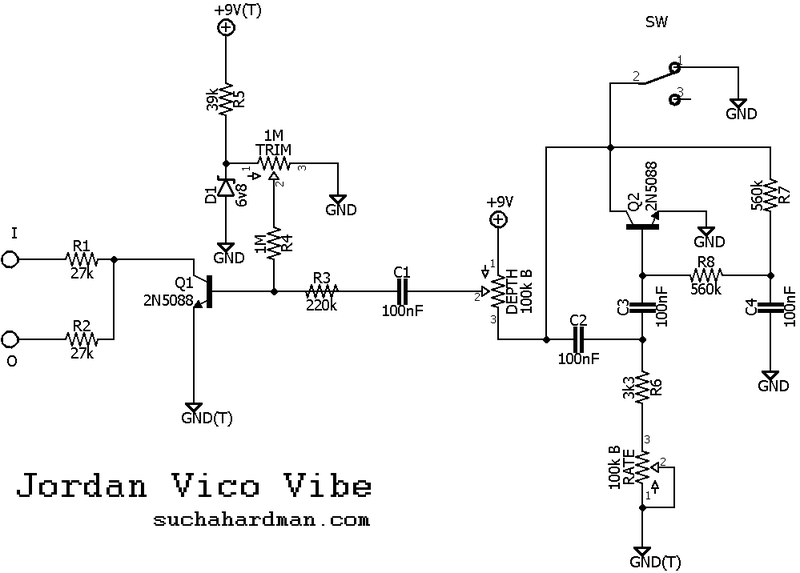 The vico vibe is reported to have a volume drop when engaged and the circuit is kind of unusual. It doesn't have any buffers, just two resistors and an LFO that periodically dumps all signal to ground to create the tremolo effect. 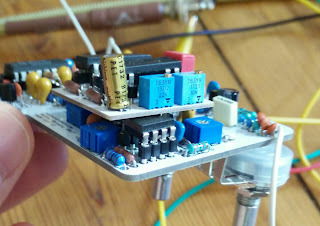 I assumed the volume drop needed to be counteracted with a boost circuit, so I built an SHO mosfet boost and connected it right after the circuit. 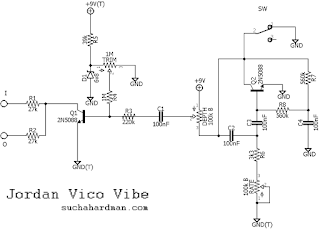 The volume would be set with a trim pot and another trim pot was used to bias the vico vibe circuit. 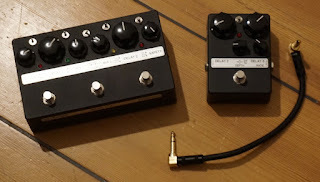 I connected these two circuits in series in one box and after careful calibration by ear they sound great. 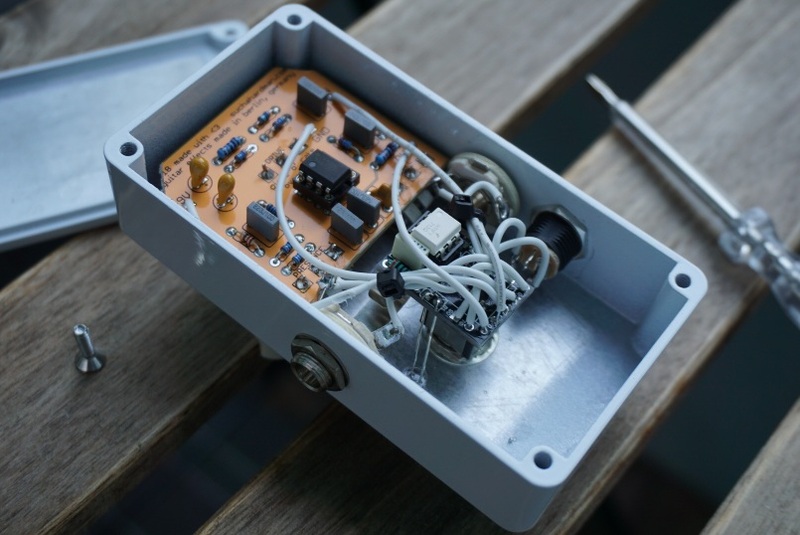 This is vital, though, as the DEPTH and TRIM control interact and trim set too much to either direction will affect the minimun depth, which will make the tremolo disappear. 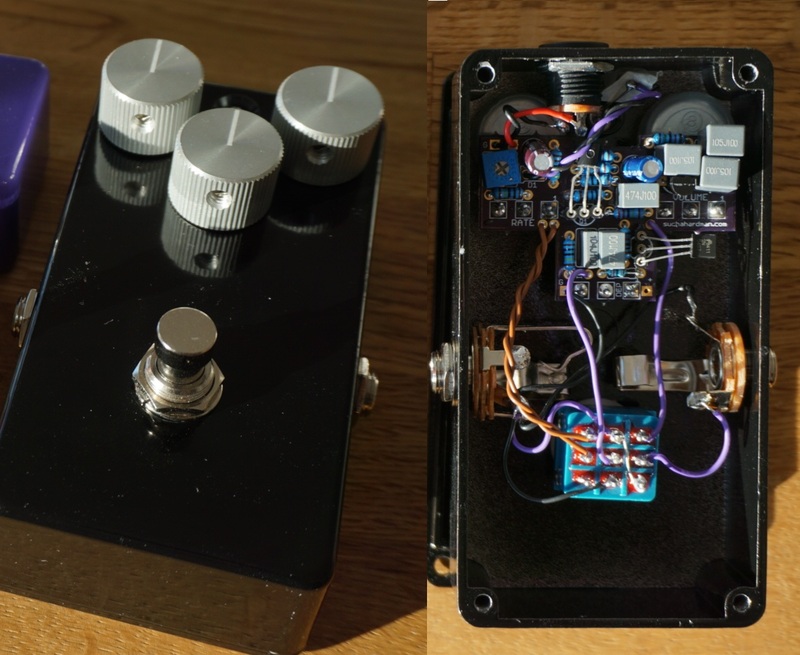 One is the two vero circuits in one enclosure with two rate controls (red and blue knob) that can be switched with the left footswitch. The other one is both circuits built on one pcb and fits in a 1590A. 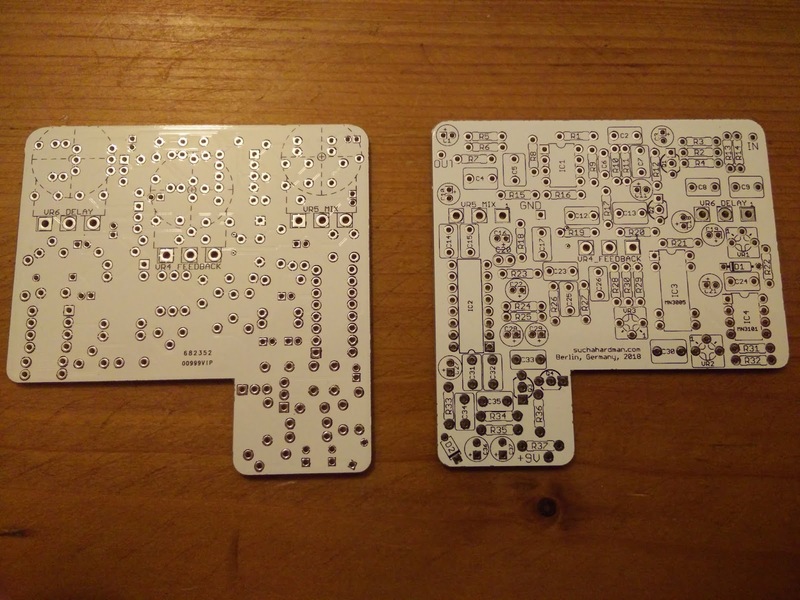 I shared the pcb and it can be ordered here (note I don't make money on shared projects). I started a Patreon as a "Tracer's Fund"
I have just decided to start a Patreon to collect funds and gauge interest to trace new circuits. It's always better not having to worry about breaking stuff and not being able to sell the pedal on and recouping the money invested. The costs are covered means I can desolder components to measure them and really see whats hidden under them. It also means I can be more efficient with my funds, develop higher quality DIY projects and open up vintage, boutique and hype circuits nobody has touched yet. 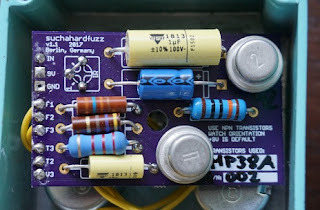 Right now I have an Echoczar Quad XV in my possession that I would like to trace and publish a schematic, but I'm reluctant to open it up and desolder components because of the high price and out of fear I might break it and not get my money back (they are around $1000). 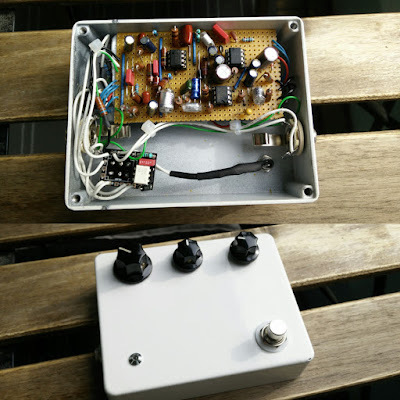 For a while now, I wanted to build a nice, good sounding tremolo effect. 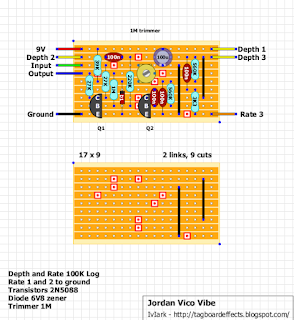 I built the vico vibe in the past but it's quite finicky to bias and has a volume drop when engaged, but compensating this with a simply SHO-style boost after it led to weird interactions. Once it's biased it sounds great, and works well with fuzz and overdrive in front of it. It's actually one of my favorite effects. But in this case I was looking for something that would be more versatile and would simply work and be reliable. 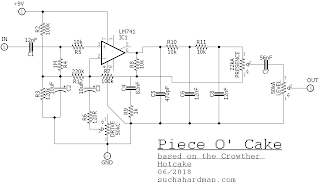 I read a few blogs and recommendations and one website that always intrigued me was Runoffgroove and their original circuits as well as their archive website homewrecker detailing clones and mods. 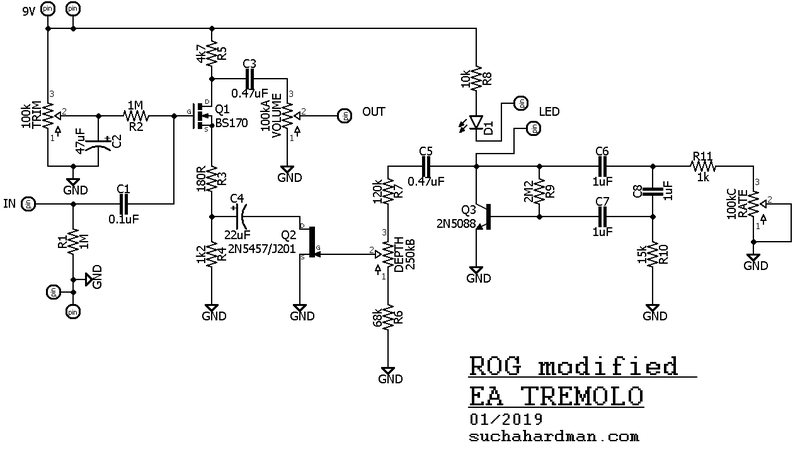 This is where I found the "modified EA Tremolo", which is based on a circuit found on General Guitar Gadgets, which in turn was inspired by a tremolo circuit originally published in 1968 in the Electronic Australia Magazine. Phew. 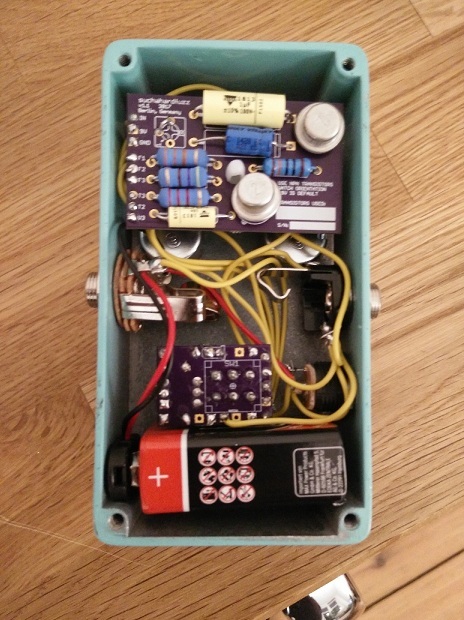 My requirements for this project were that I wanted to make a layout that has board-mounted pots, is reasonably small, allows for the pulsing LED to be used both as an on/off and rate indicator (to only have one LED for both), and I wanted it to fit Tayda's new predrilled enclosures. I'm tired of drilling them by hand and sometimes it's nice to use a painted predrilled enclosure and whip something up in an hour. I made a layout in Eagle and got it fabricated at oshpark (here is a link to order my shared layout). During assembly and firing it up for the first time I though I had made a mistake because there was no sound when the effect was engaged. I also had weird voltages. However the trim pot needs to be adjusted until there are 4.5-5v at Q1 drain. This voltage does not come gradually, it's suddenly there at one point in the rotation and the range is really small, so be careful to get this right, otherwise there is no effect. I subsituted the BS170 for a 2N7000 (opposite pinout), the J201 for a 2N5457 and the 2N5088 for a BC547 (I think), as I had these on hand. It came out great and sounds pretty good. More "gentlemanly" and subtle than the vico vibe, which I will present in another post (it's a longer story). Maybe I will add a sticker or paint something on it, or maybe I'll keep the bare black/aluminum look. In 2009 the original Way Huge Aqua Puss mk1 was reversed on freestompboxes.org and revealed to be a slight variation of the Boss DM-2 with Panasonic MN3005 Delay Chip. 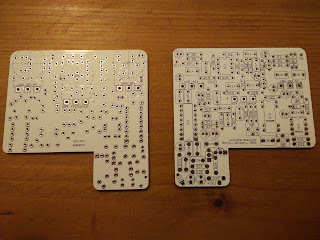 There was a community project and a PCB made up and luckily I managed to get one of the last ones in 2012. It spent some time in a box until I finally got around to finishing it a few years ago. Unfortunately, many of the original links and pictures were dead by the time I got around to working on it so I had to kind of scrape the few tidbits and a BOM together to finish the pedal. 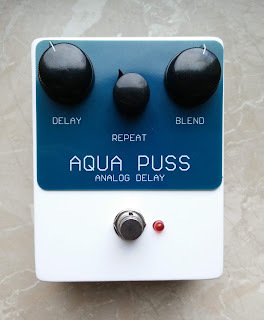 The early Aquaboy project on madbeanpedals.com, which was at first focussed on the Way Huge version rather than the original DM-2 was a great help. 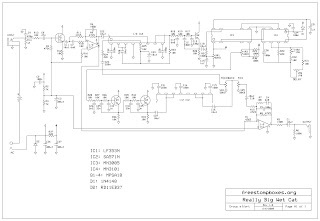 It featured the schematic and a partslist that could be related to the original schematic. I managed to finish the pedal, put it in a tall 1590BB and even calibrate it with the DM-2 instructions. This is how it originally looked. I built it exclusively with Dale CMF55 resistors and wima and panasonic caps. I order to make it as high quality as possible, I also drilled holes for the little tabs to keep the potentiometers from turning. Usually everyone just clips those tabs off, but they have a reason. Unfortunately that meant the holes could be seen next to the knobs, which isn't such a pretty look. I decided to add a control plate to hide the extra holes for the pots and to tell me which knob is controlling which function. This is made from PCB material without copper tracks and was designed in Eagle. It looks really good now in my opinion. 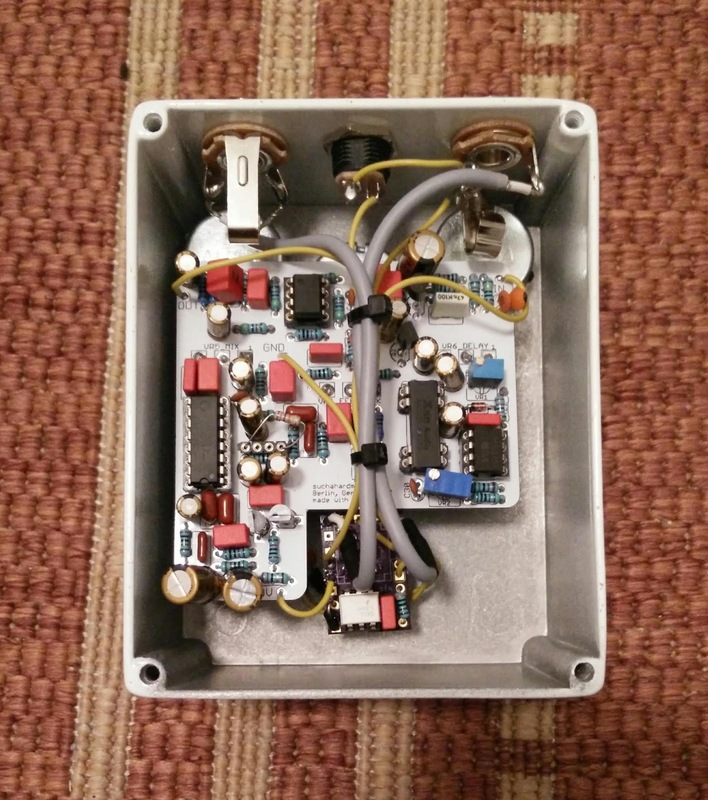 As the PCB I acquired was the last of the FSB community PCBs, and I started getting the hang of Eagle, I then decided to make my own PCB and maybe try a few mods and sell a few pedals if there is more interest. It took a few days, but I made a PCB layout that was inspired by the original Aqua Puss, but a bit smaller, giving me more room to work with in the box and maybe allow mods like double time and modulation. I got them fabricated and they came out awesome and work beautifully and for some reason are quieter than the FSB version. I have a few left for sale on my site including a download with partslist and schematic for anyone who wants to try to build their own. 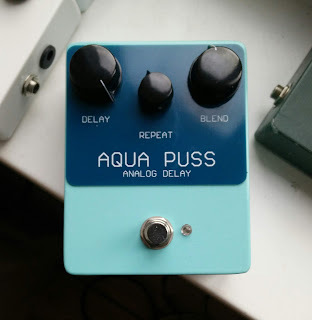 This is the second Aqua Puss Mk1 I built, the first with my own PCB. 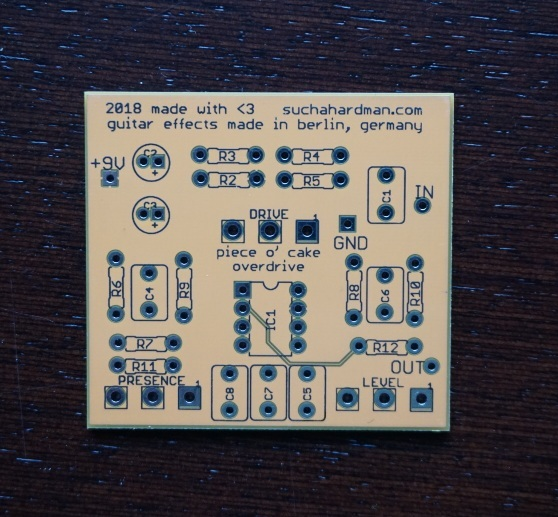 (this one actually has the first version of my PCB, which required two jumpers to work because I forgot the connections on the schematic. V2 shown above now has more generous distances between the components and works right away). My third version was built with some tantalum capacitors instead of the electrolytic caps near the BBD to allow for a double delay board daughter board that plugs into the original BBD socket. 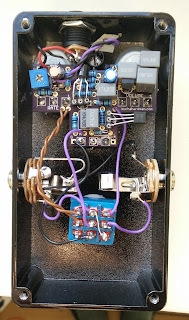 I traced sabrotones dual delay board and made my own PCB that I got fabricated. It works as expected and calibration is not as difficult as I thought. One simply has to calibrate with one BBD as usual and then plug the BBD into the first slot on the double delay board and calibrate the second BBD with the remaining trimmers the same way. This is the finished product. I decided to rename it the Acqua Vitae to avoid issues with copyright and underline it's not a straight "replica" like the FSB board, but rather a reinvention inspired by the original APmk1. It sounds noticeably warmer/darker with two BBDs but the delay time more than doubled (I'm guessing due to the additional darkness clock noise is filtered slightly better and the BBDs can be adjusted for longer delay times). I guess the tantalums in the signal path also darken the signal slightly. 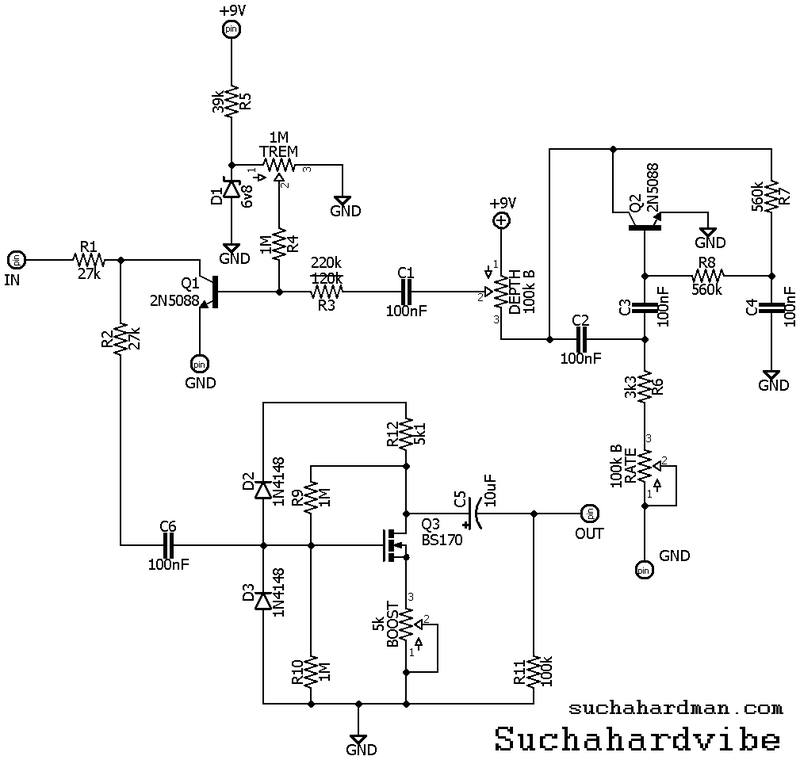 I'm currently working on a version with modulation and a few more quirks that I will talk about in another post. This post is long overdue, since I already posted about building the Klon Buffer in 2012. This is around the time that I built my Klone as well, but I never made a post about it. 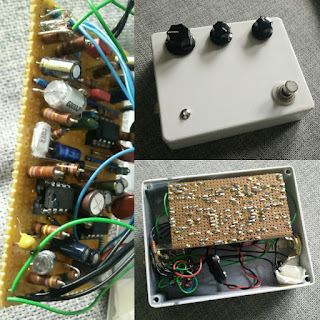 Back then I was obsessed with reading about the Klon and how people would pay $1000 for the right one (this was before the KTR, just after it was reversed on FSB). Now Klones are ubiquitous and even major pedal companies like EH and MXR have their versions, sometimes even in a tiny 1590A format. 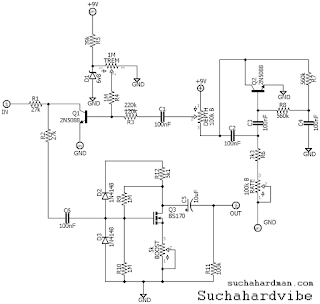 When I build mine it has to be perfect, I thought, and since Analogmike swears by carbon composition resistors for his Sunface, they must sound better, so I'll build my holy grail pedal with carbon comps as well. Those are the big brown cylindrical ones. The modern KTR is built with tiny surface-mount resistors that are used in many modern electronic devices. Go figure. Back then I didn't do my own layouts and didn't have a schematic. I simply trusted it would work. And luckily it did! The pcb turned out nicely, but the offboard wiring was a mess and I "insulated" it with tissue paper (real classy). It only had a battery snap, no power jack, and would whine loudly when the battery was empty, because of the voltage doubler. It wasn't really reliable and I lost interest after a while and lent it to a friend (who kept it for a few years). A few weeks ago, I remembered the pedal and got it back. 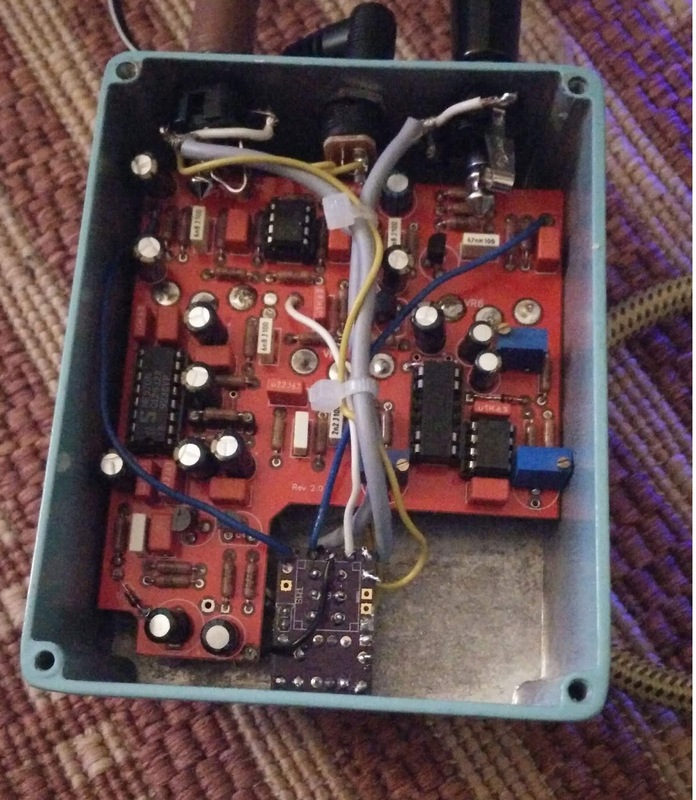 Now that my pedal making skills had improved a bit, I realised the PCB could be easily salvaged and the pedal "refurbished" to make it more reliable and easy to use. So I took it apart, drilled another hole in the side, cleaned the enclosure, flipped the pcb around, and changed the switch (optoswitch) and wiring (no battery now). Looks and plays great now! 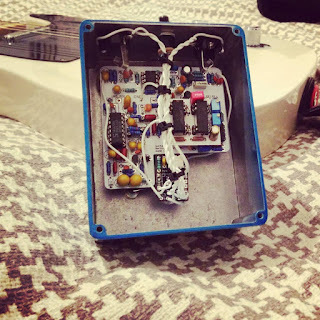 A friend of mine who is a musician from NZ asked me to build him a Crowther Hotcake because it would be difficult to get one in Europe. I researched the cicuit and it turns out there are different versions of the Hotcake, which Paul Crowther has been building since the 70ies. 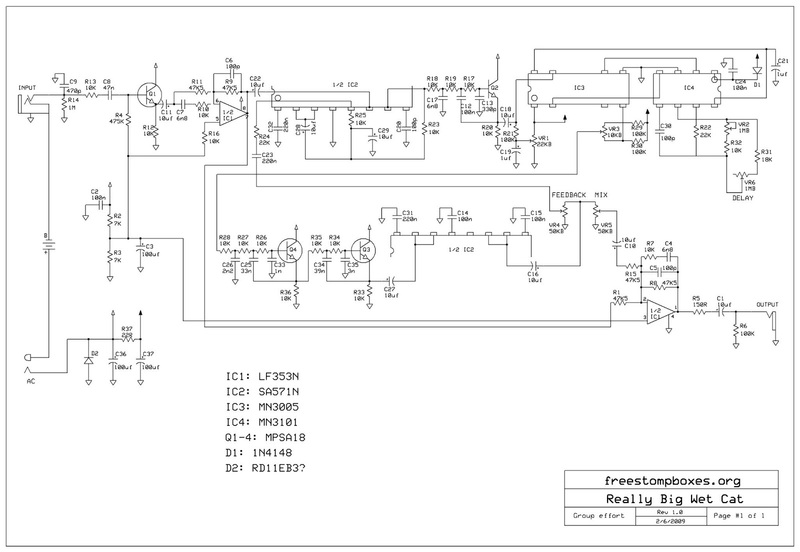 Apparently the versions sound a little different and there are two schematics online, one of the 1977 version and one of the 2003 version. I made a PCB with Eagle but there is also a vero version over at tagboardeffects. About a year ago I decided to take this guitar pedal thing to another level, so I learned eagle, founded a company and started making my effects look a bit more professional. That was at the same time I discovered Oshpark and realised how easy it would be to design a PCB and get it fabricated for cheap. 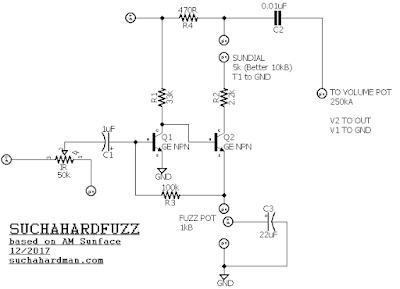 One of the effects that I always loved building as well as playing was the humble Fuzz Face. 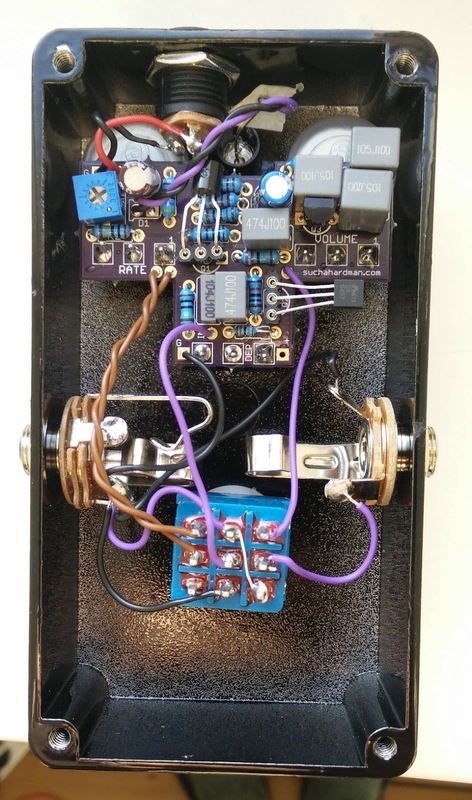 Easy to build, difficult to get a great sound out of and very particular about its power requirements and place in the signal chain (always first!). I had built a simple PNP germanium fuzz face for a friend (my first pedal) and a Joe Bonamassa spec PNP Fuzz Face with russian germaniums. 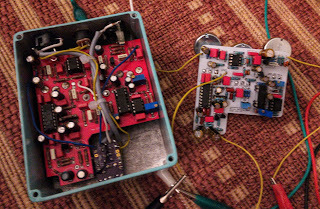 But they needed batteries, and I didn't want to add a power jack for positive ground when that could fry my other pedals daisychaining it. Another Fuzz Face I have always been lusting after was the Analogman Sunface. It sounded great in those Gearmanndude videos and others. And there were different versions with different transistors, but they all sounded good. Another thing I liked was the bias/sundial knob, because that would allow me to get different sounds and adjust the pedal during different ambient temperatures (germanium transistors are finicky regarding changing temperature, Hendrix apparently put his FF in the freezer prior to recording). 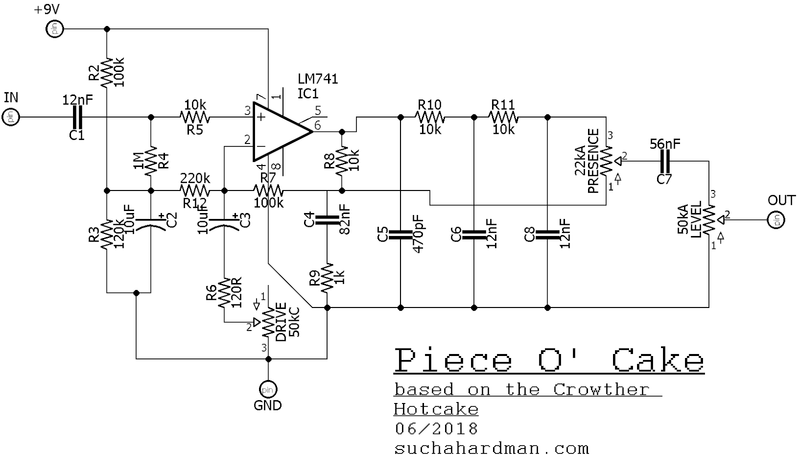 So I looked at the schematic (it was traced and very close to a regular Fuzz Face), and converted it to NPN to play nice with my power supply and to be able to use silicon or NPN germaniums (Which I had bought cheaply). And I made a PCB in Eagle. 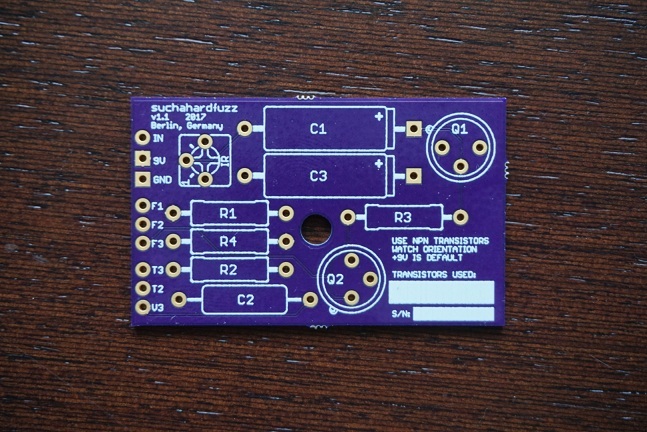 Oshpark accepts Eagle files directly and sends out 3 PCBs with world wide free shipping. They are very high quality prototype boards (one can unsolder components several times without damaging the PCB itself). Next I picked up some mojo looking components (carbon comp or 1watt metal film, axial caps) and some NPN russian germanium transistors (I bought a box of MP38A, which fall right into the goldilocks zone for Hfe, low leakage and are very decently priced) and went to work. The other thing I did is design a front plate, which is a PCB without copper traces (it only has the writing on it), which I also designed in Eagle. 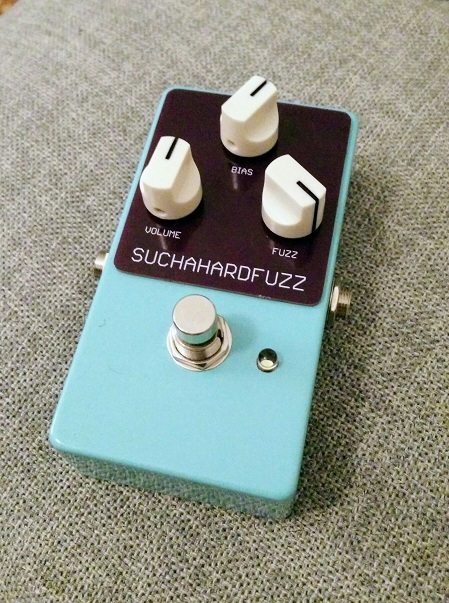 I called it SUCHAHARDFUZZ, since I named my pedal company suchahardman guitar effects, a pun on my name. 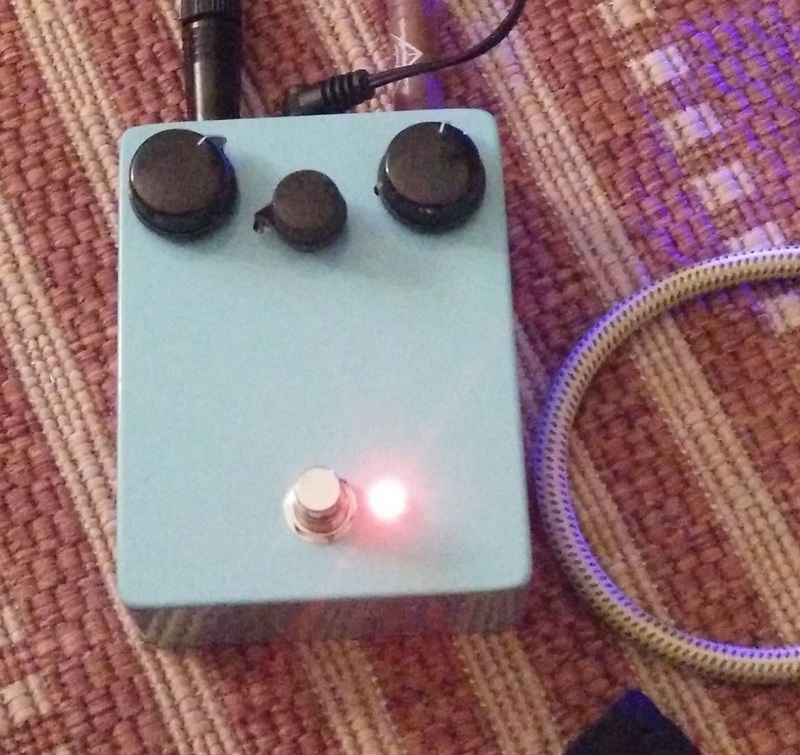 The end result is a great looking and sounding fuzz. I made two and gave one to my cousin for christmas. This fuzz face is NPN and thus can use a regular power supply with other effects in a daisy-chain, as well as batteries (though my personal pedal doesn't have a battery snap anymore). I also used an opto-switch which I will present in another post soon.